Recognized sustainability and green building expert, author, consultant and speaker – Holley Henderson is the Common Sense Environmentalist. She has been honored as a LEED Fellow, the green building industry’s most prestigious professional designation. This designation is based on her history of excellence within these dimensions of sustainability – advocacy, education, leadership, technical and commitment. Prior to founding H2 Ecodesign, Holley was with tvsdesign for ten years where she began their green studio and later served as Interface’s Director of Creative Design. Both of these experiences provided her with a unique perspective into the needs of owners, manufacturers, and design firms relative to sustainability. Holley brings a wealth of experience and knowledge of the LEED certification process. Providing executive quality control, she facilitated the certification of Interface Showroom and Offices, the first LEED-CI Platinum Level Project. Holley has led several other “firsts,” including the first LEED-CI project in China (Gold Level), and the first LEED project in Thailand, a manufacturing facility, both Interface buildings. Another original is the first Platinum Spa – Natural Body Spa & Shoppe in Atlanta, Georgia. Recently, H2 Ecodesign completed an over two-million-square-foot LEED-CS Platinum project for the largest energy provider in Thailand. Holley was appointed to the National USGBC Market Advisory Committee where she served as Chair and represented this group on the National USGBC LEED Steering Committee. She is a charter member faculty for the National USGBC LEED Workshops and was a member of the core team who developed the original USGBC LEED-CI workshop curriculum, as well as, the advanced 300 level. Recently, the National USGBC introduced LEED v4 and selected Holley to present for both the online education and the first Greenbuild workshop. 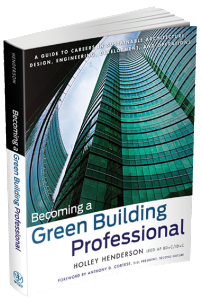 Based on these green successes, Holley was asked to author the book Becoming a Green Building Professional, recently translated into Chinese. This book is a tremendous springboard to share insights from over 300 interviews she conducted. Currently, both Wells Fargo and Contract Magazine have engaged Holley to serve on External Advisory Boards. Holley lives in Atlanta with her amazing dog, Sir Winston Longfellow. She enjoys painting and travels often exploring over 15 countries. While she is a vegetarian she has a weakness for bacon because it smells like home.